Happy November! It’s a busy but thrilling time of the year, with Halloween over and Thanksgiving on its way, the temperatures dipping into sweater and coat weather, and the realization that 2015 is coming to a close. But can we make time for a little elegance and glamour? Because Adrienne of The Rich Life in Wine Country and I wanted to highlight one of the most beautiful neutrals around—gray! 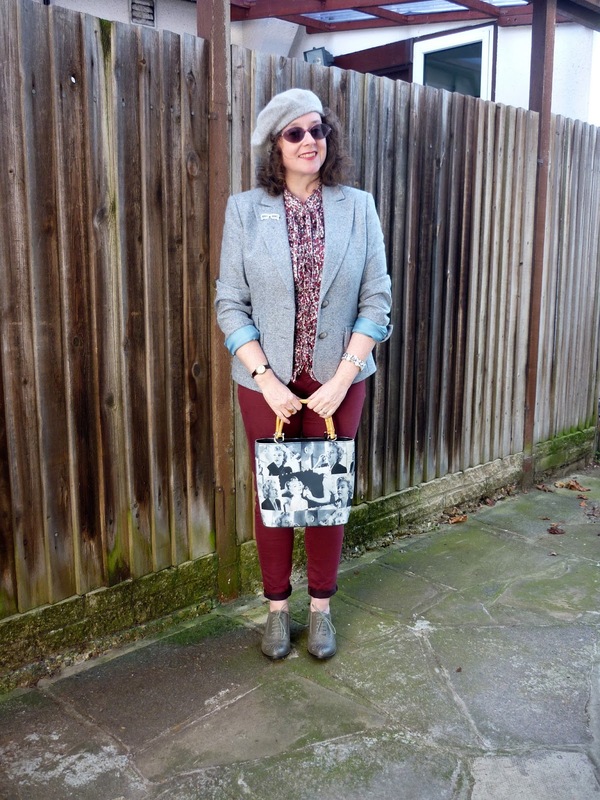 I cannot believe I am writing this, but this is the 4th anniversary post of “How I Wear My!” I do not know where the time has gone since our original post on a Missoni for Target cardigan we both just happened to purchase, but I want to thank Adrienne, my gorgeous and hardworking HIWM partner, for another year of dedication and inspiration! I also want to thank all the lovely ladies (and sometimes gents!) who join us each month and make this series such a pleasure. I am truly grateful to you all! This was a fun post to put together because of the range of grays and because everyone is looking so polished and wonderful. I hope you enjoy it as much as I have. I like this autumn outfit on Adrienne and I also like this just as a photo of her, isn’t it lovely with Adrienne in front of those colorblocked leaves? This is my new favorite picture of Deborah. She looks so glamorous and gorgeous! 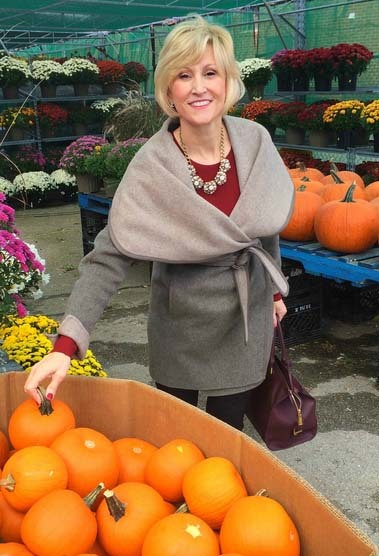 I love the entire ensemble—from the wrap coat, to the burgundy underneath it, the big necklace, the red nails, the great aubergine bag, and the splashes of vivid color the pumpkins and mums provide! This is one of those photos and ensembles from Tamera that really make me think of old Hollywood. I love this look and I think legendary costume designer Edith Head would have loved it too! Susan of High Heels in the Wilderness. This is such a great outfit on Susan and you know I never get tired of a brooch so I am especially crazy for Susan’s choice in jewelry! 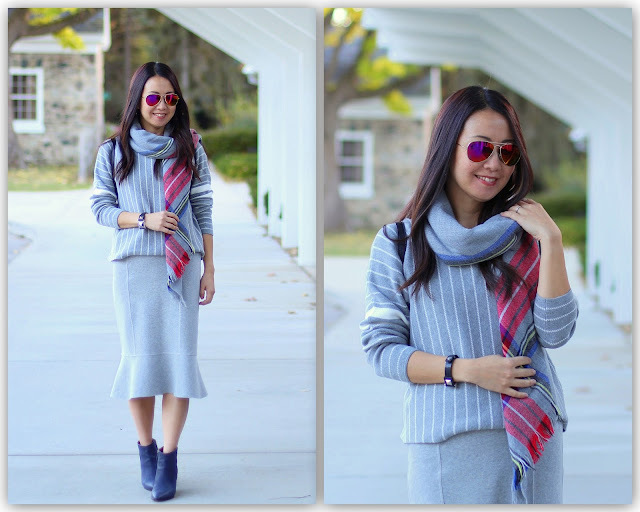 Nicole of High Latitude Style. An interesting color theory from Nicole and thank God she keeps them on their toes in Alaska, and at science conferences, with visually compelling outfits like this one. I am digging those silver pants on her, especially with the snakeskin high heels! Ana looks so casually elegant in this ensemble and I like the addition of the necklace, infinity scarf, and a pop of red on her nails. Ana thought we should take a poll on how people prefer to spell the color, so which is it for you, gray or grey? I always think of grey as the way it is spelled in the U.K., but if you have any firm information on this, let us all know! I like this mix of edgy and girly in different shades of gray on Dawn Lucy and I think this may also be my new favorite picture of her! 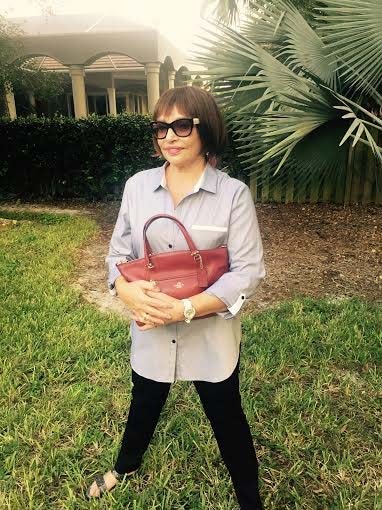 My good friend Rosie joins us wearing a long pale gray blouse tipped in white and paired with slender black trousers. Her bag is in one of my all-time favorite shades of red and that, along with her glam sunglasses and chunky watch (and maybe the palm tree fronds too), make the whole ensemble pop! I am loving this combination so much, especially the bag, which features different photos of Marilyn Monroe, some of them showing her trusted makeup man, Whitey Snyder, touching up her face. Good ol’ Marilyn! Jacqueline looks amazing in a range of grays, especially with the burgundy as a backdrop. Love this look! What a lovely fall look on Suzanne. It makes me want to add a skirt like this to my closet. Malia of Style by Malia. I love that the inspiration for the whole outfit was built around the scarf! I often do the same kind of thing. I also really like that Malia is wearing these pale colors in fall, when most people are reaching for black, navy, and dark gray (myself included). 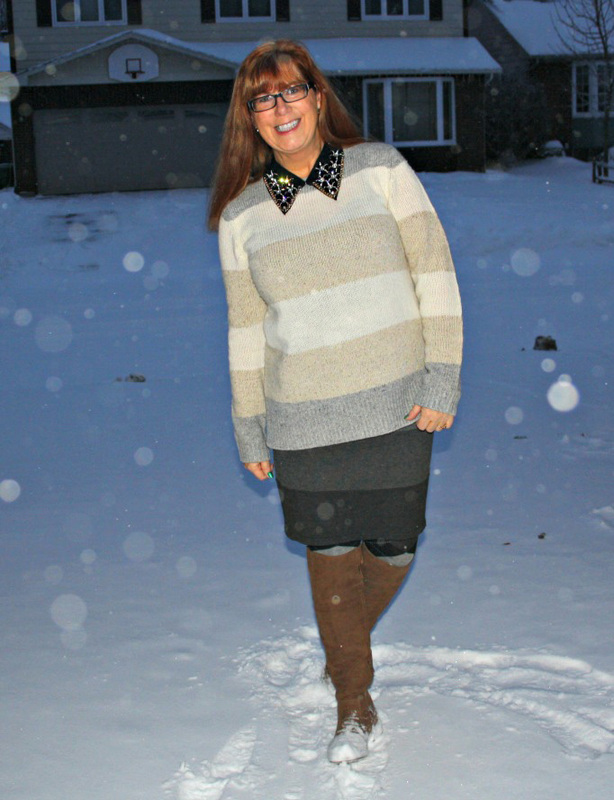 I like the colorblocked stripes and love the addition of the sparkly collar above the sweater. I hope that is snow from last year and not the current weather where Linda lives in Canada! Alice—our resident mix-master looking so stylish!—brings up a great point about using certain articles of clothing to contribute to the feel of a season, without adding extra clothes. Do you ever do this too? This is such a nice outfit on Pam and I love the additions of both the lavender scarf, the long necklace, and the dark nails. Elegant and feminine and perfect for November! 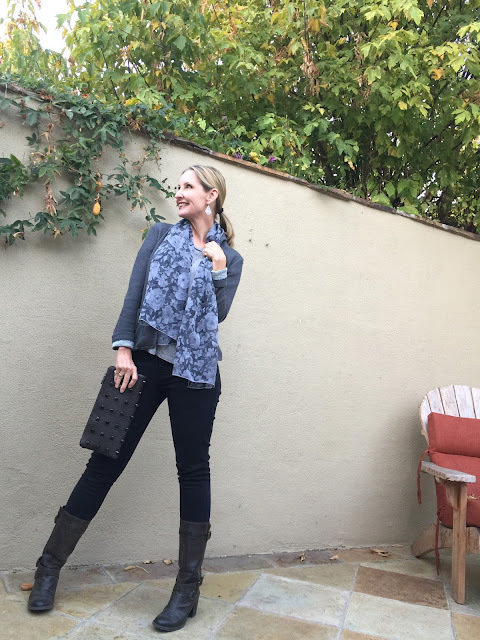 I always love dark gray with a shot of deep color and this is the exact kind of combination I would favor myself: a cardigan paired with a bold Hermès scarf! Happyface has also added a lovely little Louis Vuitton bag and a collection of bracelets! 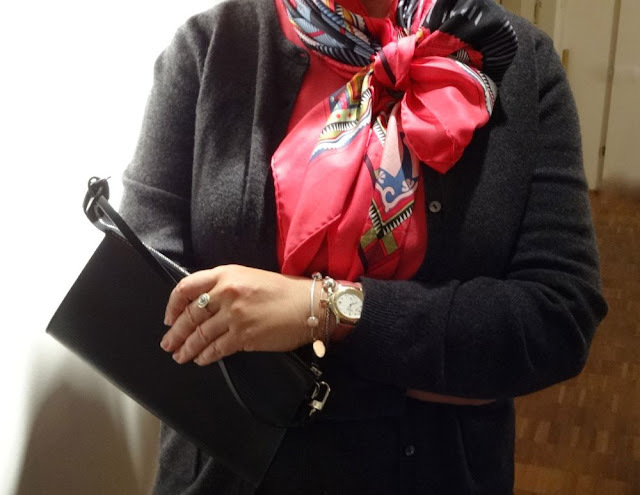 I love this dark gray worn with a deep pink scarf. I love jacquard fabric so much so I am a big fan of this look. I am also dying over her vintage Hermès Lydie bag—so beautiful!—and the addition of red high heels. 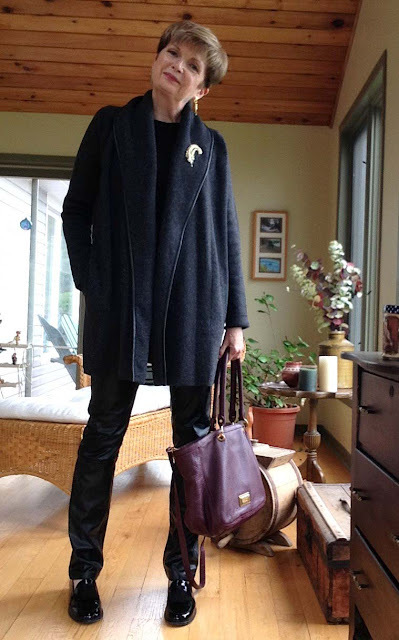 Nora always inspires me with her jackets and jewelry, as well as her terrific bag collection! I like that Trina is so true to gray! I also like that she is wearing lighter shades of it, which is something I’d like to try myself this winter. 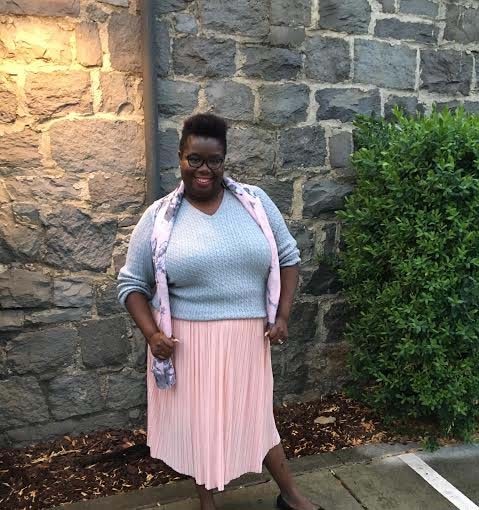 I love this look on Cynthia so much, from the pattern in the pale gray sweater, to the trumpet skirt, to the vibrant color of the scarf she paired the ensemble with. So glamorous! I am so into this look on Cherie, from the terrific over-the-knee boots, to the long cardigan and hallelujah, it is nice to see an old school frame handbag in red leopard. Love it! The bag is already sold (darn it all), but there are many more to love over at Cherie’s shop! Love that handbag! I hope it went to a good home. 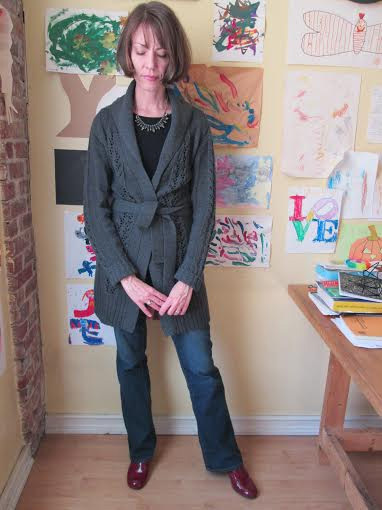 I really love all shades of gray but once fall is underway I am always drawn to a charcoal tone, like this shawl-collared long cardigan from Express that I have had for a few years. I like that the shawl collar offers an opportunity to show off sparkly jewelry so I pulled out my trusty J. Crew crystal baguette necklace that I bought a couple of years ago and still love so much. I have featured it on the blog several times because it is one of the best jewelry purchases I have ever made. It looks good in all seasons next to all colors, but it is especially wonderful when paired with gray! 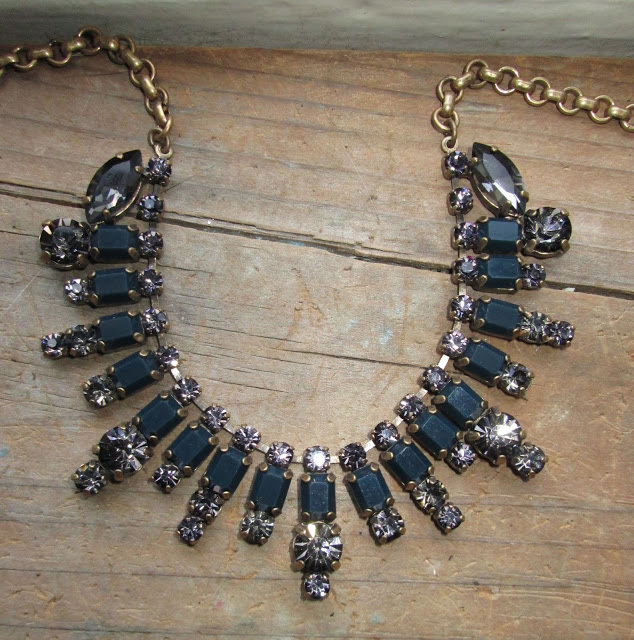 I love the gray tones in this necklace. 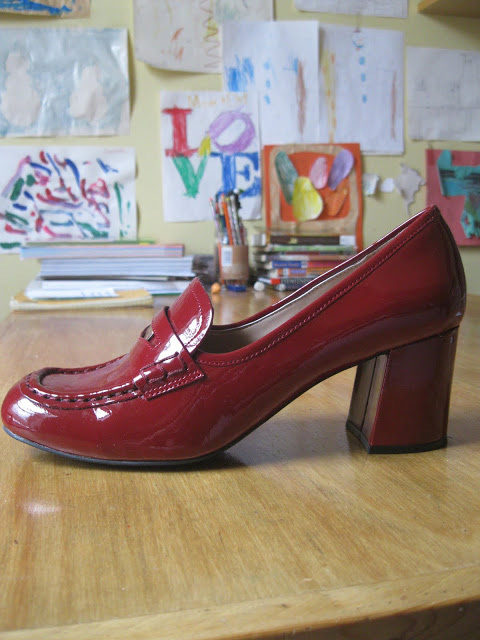 I also love red with gray so I pulled out my Tahari patent loafers in Ruby Red which were part of the post “How I Wear My: Burgundy and Bordeaux” back in 2012! This shade of red looks so good with gray. By time we meet again the holiday season will be in full swing! With so many occasions for dressing up, it would be lovely to break out your best jewelry in honor of the season, and these days we are partial to pins! 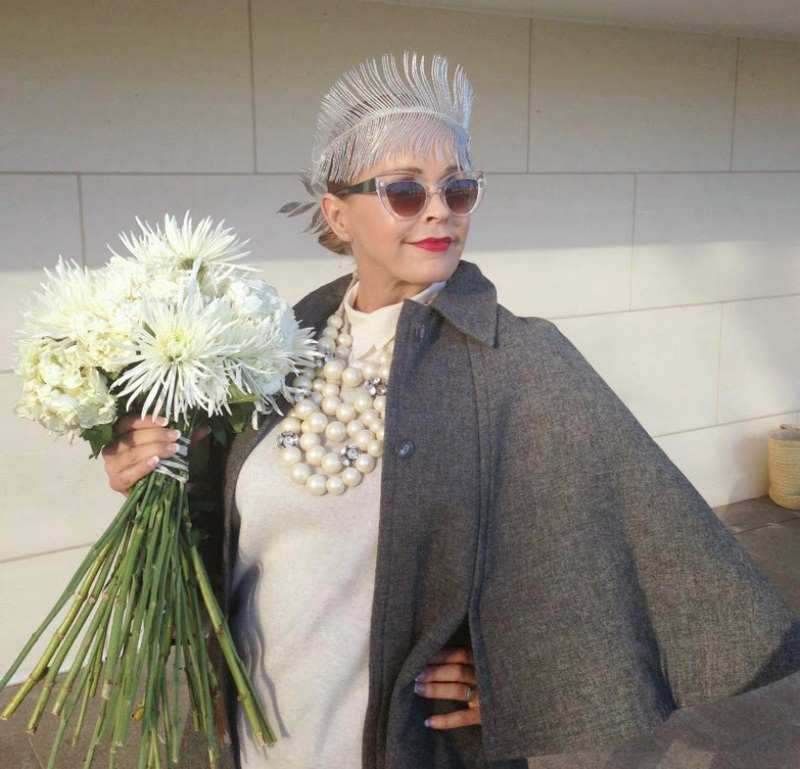 So join us in December for “How I Wear My: Brooch.” Whether it’s an heirloom piece given to you by a family member or some little vintage (or modern) gem you picked up at the thrift shop, we would love to see how you style your brooch! Send photos to us at howiwearmy@yahoo.com by December 7, 2015 and be sure to include details! 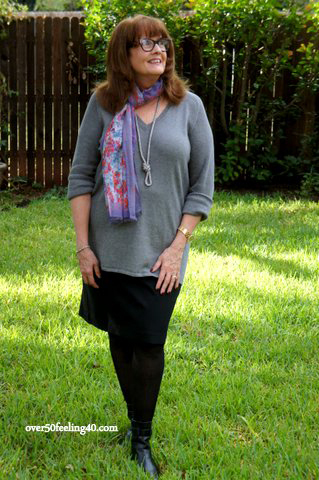 Do stop by Adrienne’s to see even more fabulous looks in gray. And THANK YOU to all the fine foxes who participated this month and who have helped to make this series so great for four years! Woo-hoo! Thanks for hosting again ladies! It is always such a pleasure to see so many versatile looks based on one theme. This post shows that everyone can wear some shade of grey and look great. Always so fun to see all these stylish ladies wear a different theme. I am lusting after those loafers jill! Hope to see your Thursday for TBT Fashion link up. Everyone looks gorgeous in grey! Loving all the cute grey jackets, coats, sweaters, etc. Jill, your necklace is so pretty! Sorry I missed the challenge, I had recently bought a charcoal grey plaid poncho (inspired by the last challenge!) too. Next time! Thank you for being such a wonderful partner and friend! Who would have thought - FOUR years?? Everyone looks fantastic. I just love gray and wish I had more in my closet. Love the grey BC I wear it a lot. Is it okay if I send a pic already posted on my blog for the next brooch one? Jill thank you for once again hosting your lovely HIWM roundup! Always one of my favorite posts to see all of the different style interpretations of the topic! I agree with you … Trina's use of all light grays looks so beautiful! Kudos to you for your lovely ensemble working the dark gray! I am so looking forward to some real sweater weather here in SoCal! Everyone is looking lovely as usual. I love your red loafers Jill and that necklace is so stunning. Thank you so much for hosting yet another fab HIWM!! thank you so very much for putting this post together! Every month I look forward to seeing all these wonderful ladies showing their special way of wearing whatever was asked for. It's always inspiring and fun to see and read. Your sweater is lovely, the shawl part comes in handy the colder it gets. And you've just found yourself a new fan for your shoes…they make all the difference and yet they look very comfy. I'm already thinking about the December brooch(es). Big hug and thank you again! Jill and Adrienne, Thank you so much for hosting another great link up - Gray is one of my very favorite colors. And, I never know, is it grey or gray?? I am already looking forward to your next one - The Brooch! So chuffed to be included in this month's series especially amongst some of my favourite bloggers too! And thank you for adding the detail about Marilyn's make up artist - Whitey Synder. I didn't know that - you really are a Marilyn fan! Thanks to Jill and Adrienne for hosting. 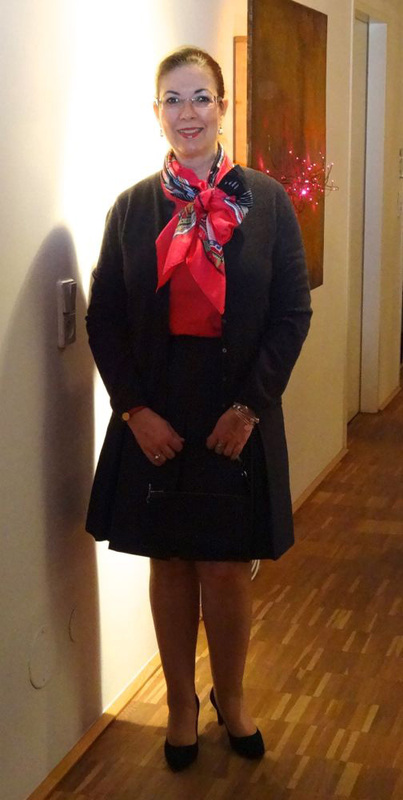 Love the fact that the next one is The Brooch as I do love wearing brooches. Another fabulous HIWM feature! Really loved all of the gray looks since gray is my favorite neutral. Also, happy happy anniversary to HIWM! Another great post. Gray is an absolute staple in my wardrobe & now outnumbers my black pieces. And that's saying a lot. For jackets, sweaters or knits I prefer charcoal. For lightweight clothing I'll do softer grays in light to medium tones. I have read in a couple of places that French women (yes, them again) also wear a lot of gray. Jill, you and all the ladies look lovely! Here in Canada we spell the colour as grey. Super cute grey looks! What is best is that you all look so proud and happy in what you are wearing - good on all of you and keep it up!!! Hi Jacqueline! I am so glad you joined us this month, it is always fun when we have new people at the party! I am a big Marilyn fan and am really interested in how she created her glamorous look. I have read that Whitey said she had makeup secrets that she wouldn't tell to anyone, even him! There is a great tutorial video over at Lisa Eldridge's site that shows Lisa's take on what some of those secrets might have been. Hello Duchess of H! A-ha, finally someone answers it for us--it's "grey" in Canada! I feel like Americans use both spellings but I veer toward "gray" more often.